Imagine this. You're a kid, happily playing in the jungle with your mom and friends, and you get kidnapped and carried off in a cage. Then you spend the next 20+ years living in a medical research lab, where you spend all your time indoors, in a small cage, all alone although you can sometimes see others like you nearby. Then a bunch of the others get to leave and you have to stay for nine more years. Then a miracle happens -- you get to leave too! And you get to move into a home that's almost like the jungle where you were born. You get to climb and play and jump and run and hoot and holler. You get to make new friends and even recognize some of the guys from the lab! Well, that's what happened today for Don King and Sloth. At first they weren't quite sure what to think of their spacious and green habitats, but within a couple of hours they were right at home. 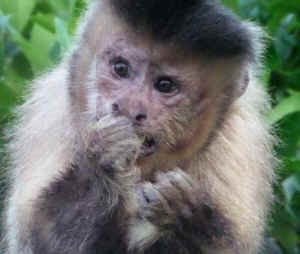 They are surrounded by other brown capuchins, including boisterous youngsters, pretty girls, and old guy friends. Don King recognized his neighbor, PC, who was released from the same lab in 2004, and they sat in the runway chattering away. 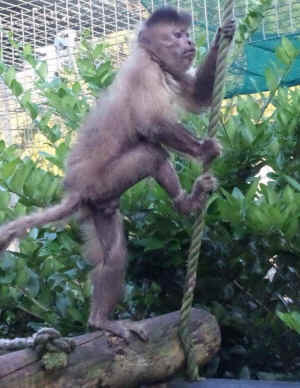 We're looking forward to these boys living many happy years being real monkeys again. They need your help, though. 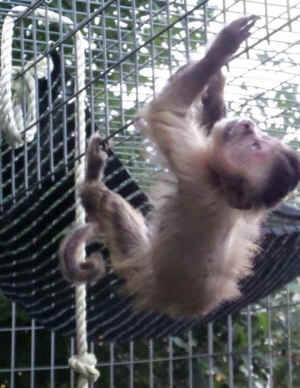 Please sponsor one or both of them, or donate to our Research Retirement Fund to help more monkeys released from research. 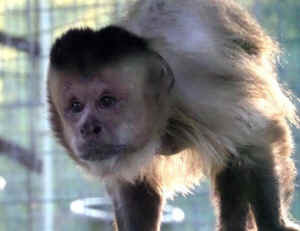 Ten more monkeys will be released from the same lab in two years. You can help us get them here!